As you are probably aware there is an election looming this year and candidates far and wide will be in search of votes. It can sometimes be difficult to keep track of who is in favour of (or against) what, so we at the Limerick Feminist Network are trying to make the process as easy as possible for you! 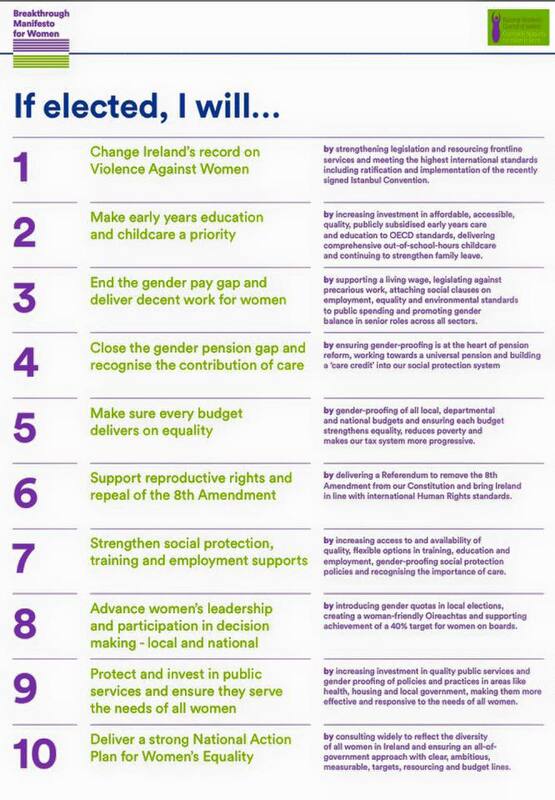 The National Women’s Council of Ireland recently launched their Election 2016 Manifesto for Women, where they are asking all candidates to sign up and commit to making 10 key issues in the manifesto a reality if elected. You can find out more about the manifesto here. The Abortion Rights Campaign have launched a General Election Pack, My Body My Choice My Vote, giving you the tools you need to talk to GE candidates about their position on repealing the 8th. This is an excellent resource and can be found here. The Disability Federation of Ireland has also launched a new campaign, Disable Inequality. Their aim is to make equality for persons with disabilities an election issue. They will do this by gathering the experiences of people with disabilities and their experiences of unfairness or disabling issues, actions and policies that affect them on a daily basis. The volume of evidence collected will be used to show candidates that it is time to end discrimination against people living with disability. You can find out more about the campaign here. You can contact your local candidates with your experiences here. 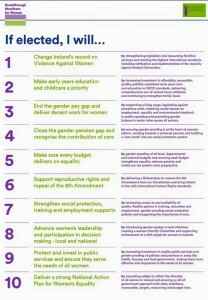 The Limerick Feminist Network are in the process of contacting all candidates to ask them to sign up to the NWCI manifesto and publicly show their position and commitment to Repealing the 8th Amendment if elected. And we are asking all of you to do the same. We will note the positions of each candidate on the table below. The information on the candidates supporting the Repeal of the 8th Amendment and the National Women’s Council of Ireland Election 2016 Manifesto for Women was taken from the below sources and was accurate at the time of posting. We will monitor and update the information accordingly.